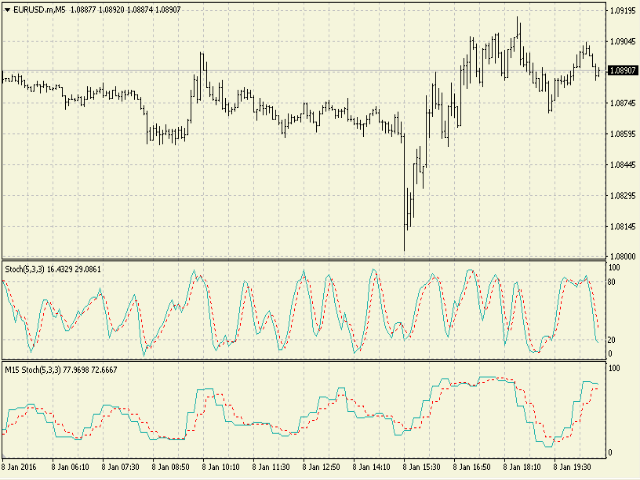 The indicator displays the data of the Stochastic oscillator from a higher timeframe on the chart. The main and signal lines are displayed in a separate window. The stepped response is not smoothed. The indicator is useful for practicing "manual" forex trading strategies, which use the data from several screens with different timeframes of a single symbol. The indicator uses the settings that are identical to the standard ones, and a drop-down list for selecting the timeframe. StochLevel - the level, above which the downward line intersection is stated. The lower level is calculated according to the formula 100-StochLevel. UseAlerts - display alerts at line intersections. Added in version 1.1: display of the moments of main line intersection by the signal line. Displayed by red and blue arrow. Can be disabled using the UseSignals parameter. Also added the StochLevel parameter - the level, above which the downward line intersection is stated. The lower level is calculated according to the formula 100-StochLevel. Added the option to generate alerts during line intersections. Can be disabled using the UseAlerts parameter.